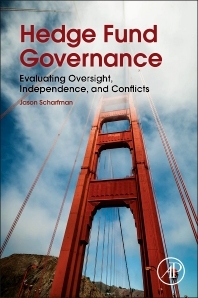 Hedge Fund Governance: Evaluating Oversight, Independence and Conflicts summarizes the fundamental elements of hedge fund governance and principal perspectives on governance arguments. An authoritative reference on governance, it describes the tools needed for developing a flexible, comprehensive hedge fund governance analysis framework. Case studies and interviews with professional fund directors shine a bright light of pragmatism on this framework. The author’s global analysis of more than 5,000 hedge fund governance structures enables him to draw realistic conclusions about best practices. He also explores the value consequences of good vs. bad governance, estimating the actual dollar losses that can result from bad governance, as well as the operational and investment performance benefits of certain governance practices. Why should investors care about hedge fund governance? How should investors think about hedge fund governance? What hedge fund entities are investors looking at to promote good governance? Is governance controlled by the hedge fund board of directors? A universal definition of governance? Is governance defined by perspective? Who is responsible for hedge fund governance? Is governance primarily an investment-related concept? Chapter 2: Hedge Fund Board of Directors: A Governance Proxy? Who are these board members? The expanding director talent pool—a blessing and a curse? Who decides who gets to be on the board? You’re not who I hired!—the “associate director” bait and switch? What do directors actually do? Why the increased focus on the importance of offshore regulations? How do regulations relate to governance? Are some service providers more important to governance? Isn’t casting a broader net better? Are “ancillary” service providers important in evaluating governance? Isn’t service provider governance simply fund operations? Why are hedge funds now talking about governance? Is the JOBS Act good for hedge fund governance? Does enhanced flexibility promote better governance? Is technical compliance enough for good governance? I said governance, didn’t I? Hedge fund internal governance by committee? Third-party operational control audits as governance proxies? Do strong operations imply good governance? Is governance a moving target? Do ongoing governance evaluations add value? Developing an ongoing governance monitoring program—a meta-analysis program? Ongoing background investigation and news monitoring for funds, personnel, and directors? The good guy problem: do “house views” result in weakened ongoing governance oversight? Example scenario: “the Sark Lark”—are certain jurisdictions’ regulatory governance regimes completely ineffective? What does valuation have to do with governance? Is a closure and a liquidator the same thing? Global governance codes—a self-regulatory pipe dream? Jason Scharfman is the Managing Partner of Corgentum Consulting, LLC. He is recognized as one of the leading experts in the field of hedge fund operational due diligence. Before founding Corgentum, he oversaw the operational due diligence function for a $6 billion alternative investment allocation group called Graystone Research at Morgan Stanley. He earned an M.B.A. in finance from Baruch College’s Zicklin School of Business and a J.D. from St. John’s School of Law. He is admitted to the practice of law in New York and New Jersey. Additionally, he holds the Certified Fraud Examiner (CFE) and Certified in Risk and Information Systems Control (CRISC) credentials. Managing Partner of Corgentum LLC., a specialist consulting firm with offices in New York and San Francisco.